Supply of heavy duty fans and blowers, centrifugal roof and wall fans, industrial process ventilators, centrifugal OEM fans, combustion blowers and furnace fans. Sales of dust collector fans, dryer ventilators, high temperature oven fans, industrial central vacuum blowers, OEM high pressure fans, as well as commercial centrifugal wall and roof fan ventilators. Made with powerful centrifugal wheels, for air exhaust from commercial or industrial buildings. Ideal for kitchens, washrooms, laboratories and other commercial applications. Centrifugal roof ventilators are designed to exhaust air through a ductwork. Upblast centrifugal roof fans - these ventilators are installed and operate like regular centrifugal roof ventilators, but with the added feature of directing exhaust air away from the roof. Wall mounted centrifugal ventilators are used where it is impractical to install the ventilators of the roof. These fans are either exhaust or air supply power ventilators. 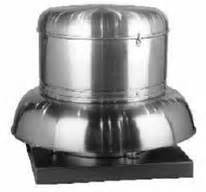 Canada Blower BD roof ventilator is a versatile, high discharge fan. This ventilator features a taller design than typical centrifugal or propeller roof ventilator fans and is especially useful in the discharge of smoke and / or fumes high above the roof line and away from surrounding ventilation systems. Three part assembly consisting of stack cap, fan section and base. Features cast aluminum airfoil blade propeller. Standard Canada Blower fan construction is heavy-gauge steel finished with air-dried gray enamel. Hot dipped galvanized, stainless steel or all-aluminum ventilator construction are optional ventilating.com fanblower.com highpressureblower.net industrialblowerfan.com industrialfanblower.net industrialfanblower.com pressureblower.net northernindustrialsupplycompany.com industrialpressureblower.com tenderall.com chicagoblowercanada.com cbblower.com buffaloblower.com buffalofan.com nis-co.com canadianblower.com olegsystems.com canadablower.com abbblower.com acmefan.net industrialblower.net fansandblowers.net americanblower.net barryfan.com cincinnatifan.net canadafans.com barryfan.net pennbarry.net pennfan.net tcffan.com. Low Profile Canada Blower Hooded Roof Ventilators provide cost effective, general purpose ventilation solutions for commercial and light industrial ventilating applications. The aesthetically pleasing modular hood design minimizes extension above the roof line. Both direct and belt driven fan models are available in exhaust and supply configurations. A wide array of adjustable pitch, cast aluminum ventilator propellers are available to meet specific fan performances and application requirements. Canada Blower also offers a complete line of ventilator options and accessories such as roof curbs, backdraft dampers, disconnect switches and special coatings to maintain single source responsibility.